This post brought to you by Gallo Family Vineyards. The content and opinions expressed below are that of Katie’s Cucina. Get ready for your new go-to summer drink. Seriously I’m in love with this easy recipe for Moscato Lemonade! It’s not too sweet and not too tart and in my opinion just perfect! Light and refreshing and perfect for sipping on a hot summers day. I sliced a lemon and rinsed some fresh raspberries to go in the lemonade. If you wanted to get crazy you could muddle the raspberries and make a raspberry moscato lemonade. Gallo Family invited me to host a Moscato tasting party in honor of National Moscato day. Four years ago, they established the holiday to celebrate the deliciously sweet wine varietal that has everyone talking. 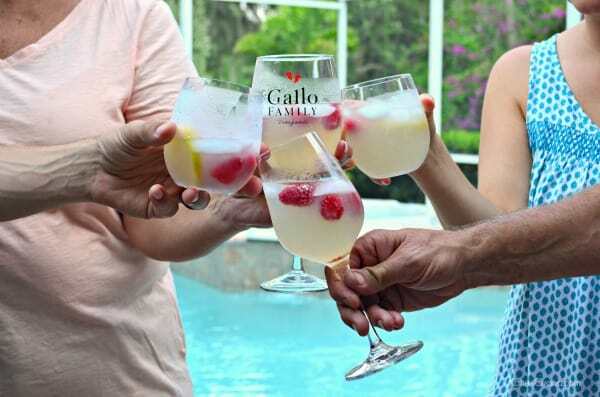 Bursting with sweet flavors of peach, honey, and ripe citrus, Gallo Family Vineyards Moscato is a deliciously sweet wine that you’re sure to love. We invited a few of our friends over to enjoy the three different varieties of moscato they produce. As well as enjoy my delicious recipe for Moscato Lemonade. I also served up a few appetizers to balance out the tasting! Let’s talk about the three different types of Moscato. 1. WHITE MOSCATO BURSTS WITH FRUIT FLAVORS– Delightfully sweet, this white wine is often simply referred to as “Moscato”. Hints of peach, honey, and ripe citrus make this a refreshing sunny day beverage. We suggest serving chilled to bring out the grape’s full taste. Consider a spring lemonade mix when hosting a pool party or backyard barbecue. For dinner, pair with spicy Asian takeout or Mexican dishes. If dessert is your family’s style you cannot go wrong with this vino. 2. SPICE UP THE NIGHT WITH A GLASS OF RED MOSCATO– If you’re looking for a medium bodied red, never fear. Red Moscato maintains peach and citrus elements with a bright berry finish. We think of this as our “cheese and wine” pairing, and if you are on the same page as us definitely try it with a Gorgonzola. Just like its sister varieties, Red Moscato is great for spicy foods and is best served chilled. 3. PINK MOSCATO WILL ROSE TINT ANY MEAL- There’s always someone who’s a little different in every family. Our Pink Moscato is just that – a bit different. It share’s the fruit flavors of white and red, but adds a hint of berry and orange. For when you’re feeling fun and fancy free, this rose-colored wine is best served cool. Pair it with your favorite ice cream sundae for a delicious and sweet treat. The Gallo Family Vineyards collection of wines offers a variety of fruit-forward, approachable styles at affordable prices, including: Moscato, Chardonnay, Cabernet Sauvignon, Merlot, Pink Moscato, White Zinfandel, Sauvignon Blanc, Pinot Grigio, Pinot Noir, Red Moscato, White Merlot, Sweet Red, Hearty Burgundy, Sweet White Blend and Riesling. (Suggested retail price: $4.99 for 750-ml bottles, $8.99 for 1.5-liter bottles, $5.99 for 187-mL four-pack.) 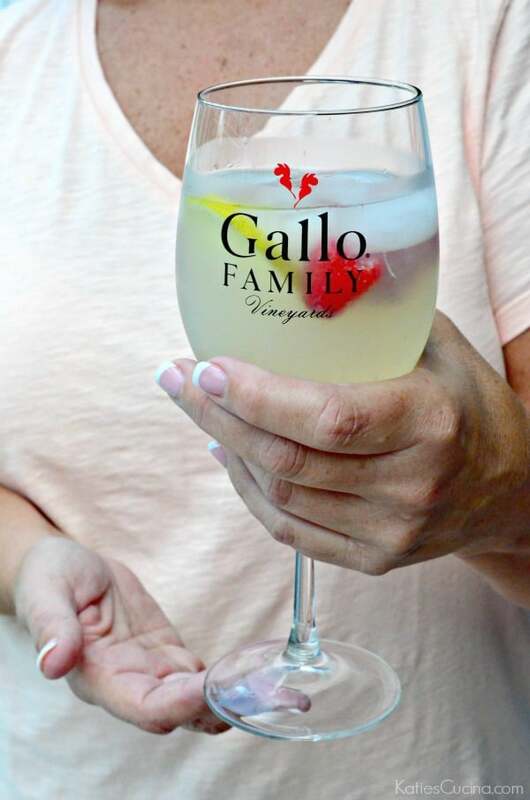 Use Store Locator Tool the to find Gallo Family Vineyards collection near you! Everyone had a great time at our Moscato tasting and enjoyed the Moscato Lemonade. 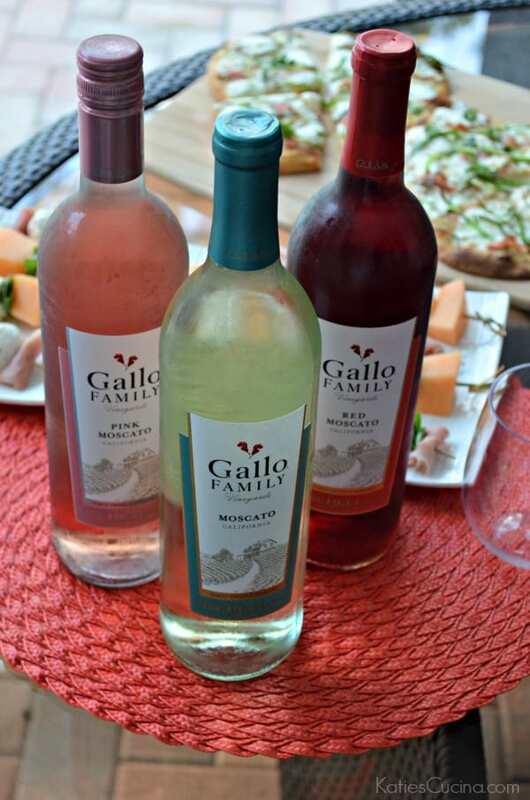 I hope you’ll consider hosting your own Moscato party on Moscato Day with Gallo Family Vineyards Moscato as your beverage of choice! Or of course make my refreshing Moscato Lemonade recipe. Make sure you join the 4th annual @GalloFamily’s National #MoscatoDay Twitter Chat on Saturday, May 9th at 9 am ET / 12pm PT. Simply RSVP for National Moscato Day! online and then tag #MoscatoDay and @GalloFamily in your tweets on the day of the party to participate! You could win fun goodies and gift cards by simply RSVP’ing and participating! 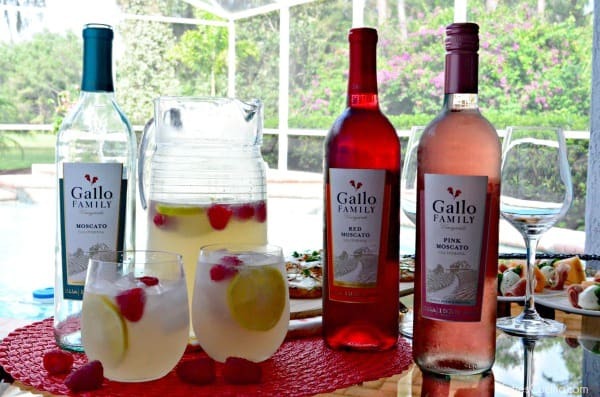 Enter to win Gallo Family’s National Moscato Day Sweepstakes! 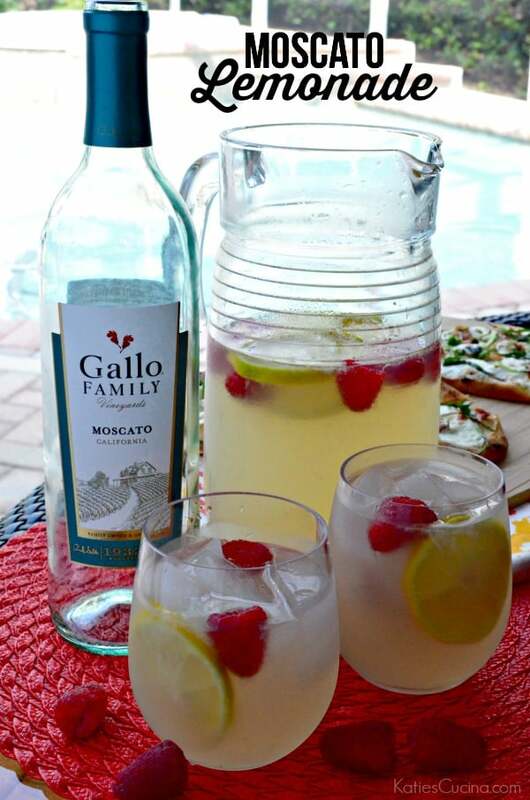 In a large pitcher combine Gallo Family Moscato with 3 cups simply lemonade. Add in half the sliced lemons and raspberries. Mix well. Place ice in glasses. 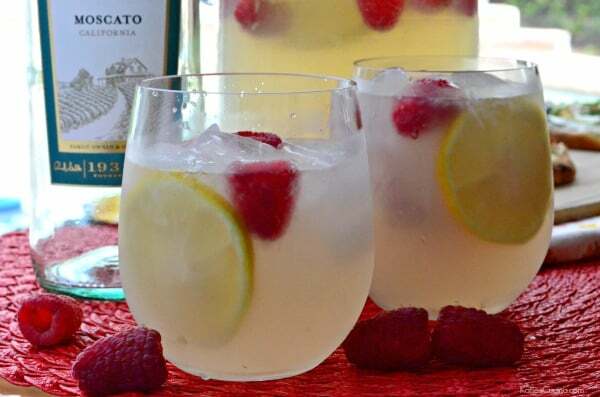 Pour moscato lemonade in each glass and garnish with lemon and raspberries. Enjoy immediately. YUM! That moscato lemonade looks SO refreshing and perfect for hot FL Summers! !